Uses advanced Bluetooth 4.1 technology to stream clear, distortion-free digital audio from your TV, smart device or laptop to Bluetooth headphones, earphones, speakers, and other receivers up to 33 feet away. With transmitter mode you can get sound NOW thanks to aptX Low Latency technology which reduces end-to-end lag time to 40 milliseconds. Eliminating lip-sync issues to give you the smoothest audio/visual experience available. As a Wireless Audio Transmitter, seamlessly streams Hi-Fi digital audio wirelessly from your TV or wired music system to your favourite pair of Bluetooth headphones or speakers. 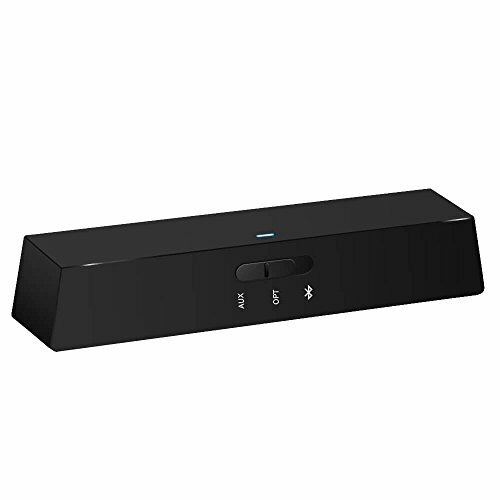 As a Wireless Audio Receiver, streams high-quality audio wirelessly from any Bluetooth enabled smartphone, computer or tablet to any music system or powered speakers. Apart from 3.5mm Aux / RCA connection, the audio Bluetooth adapter also supports optical cable input and output. With provided optical cable, you can enjoy dedicated sound channel and high-quality digital sound on both transmitter and receiver modes. Provides the widest compatibility with any device with Optical (TOSLINK S/PDIF), RCA or 3.5mm stereo audio output like TV's, home audio systems, laptops, digital streaming boxes (including Apple TV and Amazon Fire TV), etc. UPGRADED LIGHTWEIGHT 2-IN-1 BLUETOOTH ADAPTER: Powered by the latest Bluetooth 4.1 technology, use as either transmitter or receiver. U - BTR01 can pair with two headphones / speakers at once up to 33 feet (10m) away, and enjoy great music cable-free. Breathe new life into older speakers, headphones, computer or car stereos with new Bluetooth wireless connection. Hassle-free setup makes it easy to enjoy wireless audio at home or on the go. TRANSMITTER & RECEIVER DUAL MODE: In TX mode, transceiver can wirelessly steam audio from a non-Bluetooth device (e.g. TV, Computer, MP3 player, PSP) to any Bluetooth audio receiver that supports the A2DP Bluetooth profile, such as a Bluetooth headphone, Bluetooth speaker, or dedicated A2DP receiver. In RX mode, it enables wireless audio streaming from any Bluetooth enabled smart phone, computer to any non-Bluetooth music system or powered speakers. VERSATILE 3 TYPES OF AUDIO CONNECTIONS: Support for 3.5mm AUX, White/Red RCA and Digital Optical TOSLINK Input & Output. Have the widest compatibility with old and new TVs, computers, tablets, digital streaming boxes (including Apple TV and Amazon Fire TV), and more. You get maximum flexibility to connect your devices via different cables. U - BTR01 does NOT function as an audio converter, so please DO NOT use 3 type connections simultaneously. APTX LOW LATENCY FOR MINIMUM AUDIO DELAY: With the premium CSR8670 chipset, you can enjoy high-clarity sound with AptX Low Latency technology. End-to-end leg time is reduced up to 40 milliseconds; both input and output are supported. You now watch video or TVs while listening to wireless audio without any noticeable audio delay. Both TX/RX modes have been added with AptX LL and AptX. Please also order UES IDEAS - BNC40 Over-Ear Bluetooth Headphones for the best AptX performance. WHAT YOU GET: U - BTR01 Bluetooth V4.1 Audio Transceiver, TOSLINK Digital Optical Cable, 3.5mm Audio Cable, 3.5mm Female to 2 RCA Male Cable, Micro USB Charging Cable, Sticky Gel Mounting Strip, User Manual. 15 days money back guarantee and 12-month warranty of products for every customer. Our friendly after-sale service team will be happy to help for any question. If you have any questions about this product by PYQ, contact us by completing and submitting the form below. If you are looking for a specif part number, please include it with your message.